Carroll Gardens and Cobble Hill were largely spared the wrath of Hurricane, er, “Superstorm” Sandy, but quite sadly Carroll Park – the primary outdoor space for thousands of kids living in Carroll Gardens and the surrounding area — was hit hard by the Monday evening storm. The realities were much worse in Red Hook, Dumbo and Gowanus, as many businesses and homes there were terribly flooded (see our photo story). Tuesday morning there were two large trees down and several large branches strewn about the park, located between Court and Smith streets, President and Carroll. The big tree that shaded the climbing boulder on the President Street side of the park was down, which will forever change the feel of the favorite natural play area. “Now we can’t climb on the rock!” said a first-grader who was among the neighbors who turned out to survey the scene. The old boulder, though, should be back up for climbing after the city cleans away the big old tree. A basketball hoop was also down. City sanitation department workers walking around Carroll Park in the afternoon said the downed trees there were a Parks Department job, and that the work would likely get prioritized. 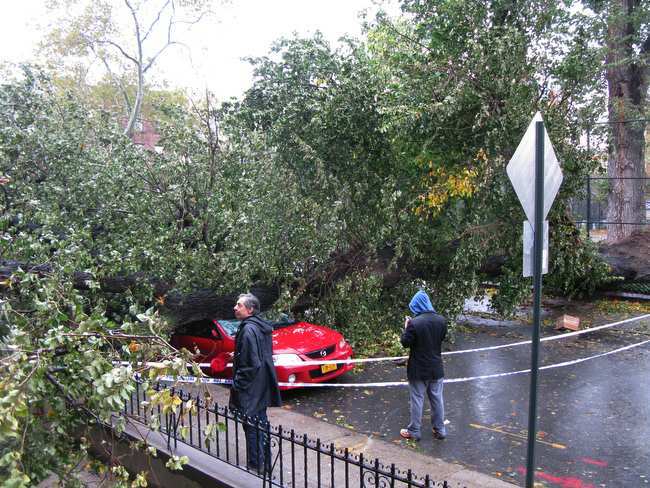 One of the trees fell across Carroll Street and crushed a car parked there. The massive tree rested in the front courtyard of a brownstone on Carroll Street and fairly well covers the middle of the street. It’s been a season of bad luck for Carroll Street. At the start of summer, a home abutting PS 58 collapsed in the middle of the night. Nobody was injured though it was quite a scare as one side of the multi-family building, home to several children, caved in. The city slowly took down the brownstone over the course of the summer. Throughout the neighborhood there were a few trees downed. Mayor Bloomberg at his 6 p.m. newsconference said the city has received 7,000 reports of downed trees. In the aftermath of the storm, the NYC Marathon will continue this weekend, while the West Village halloween parade on Wednesday has been postponed. Trick-or-Treating will go on and, at least here, with great appreciation for the fact that we came out relatively unscathed, and with a prayer for those in Brooklyn, Queens, Manhattan and New Jersey who were hit to truly devastating degree.